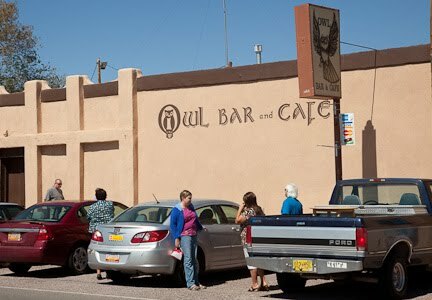 I’ve heard about this place south of Socorro, NM for years. When I’ve passed by, it’s either not lunch time or the place is closed (Sundays). This trip coincided with lunch time, and it was Friday. Nothing much to look at from the outside, and hard to see anything on the inside until at least five minutes have passed. 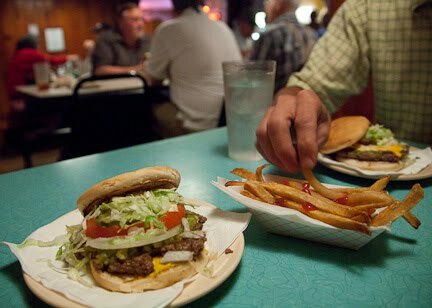 The menu is simple, but you are here for only one thing: a green chile cheeseburger. 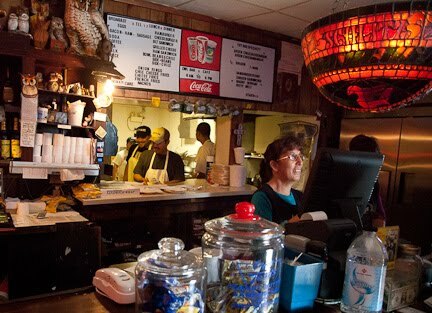 OK, the fries are hand cut and not bad, but you walked into this place that has been under the same ownership for 46 years (or maybe 47 according to the gal at the counter) for the GCCB, which today is running $5.25. Good fixings, decent bun and cheddar, tasty chopped green chiles and a nice patty made by real human hands. Ragged and a little crispy on the edges, not stamped out by a machine at some obscure food preparation facility miles, or states away. It’s a damn fine burger. The place is a classic, and it is worth a stop when you are in the area. Hell, a burger lover would probably make a special trip. Full bar, fair prices. Probably closed on Sunday.